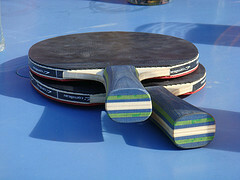 One hundred open-air ping pong tables are to be introduced around London this summer. Ping London comes from the fertile mind of Colette Hiller, who last year plonked 30 pianos around town and invited Londoners to play them. In a similarly altruistic gesture, ping-pong bats will be provided with each table, bearing the legend: "Please put me back". You won't be surprised to learn that the scheme has the hands of Boris Johnson all over it. At the 2008 Beijing Olympics, a slightly sozzled Boz went off-message during a press conference, and claimed the sport — thought to be a Chinese invention — for the Brits. Ping pong is, according to the Mayor, a descendent of "whiff-whaff", a game invented by the wealthy upper-classes in 19th century Albion. The claim is highly debatable, but the Mayor's skill is not. A dab hand with the paddle, Boris will play Sebastian Coe in the opening match of a summer tournament pitting various celebrities and artists against each other. Locations thus far announced include Terminal 5, the Albert Memorial, and Trafalgar Square, while familiar YBAs including the Chapmans and Tracey Emin will put their artwork on the tables. 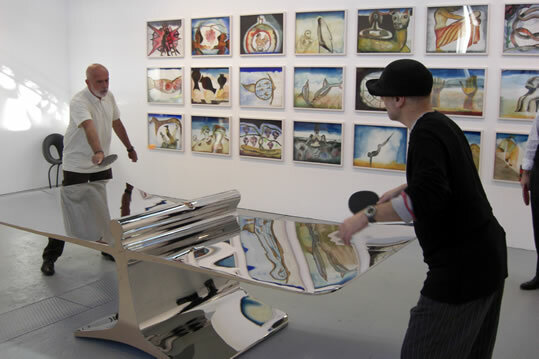 Anybody who needs to get some practice in could do worse than visit Ron Arad: Restless at the Barbican, where a curiously curved ping-pong table is ready to be played on.